“Manchester has a proud past and a progressive future and is bursting with places to visit. Today, it is one of the most exciting places in the UK. Enjoy your visit”. If you go back to the halcyon days of rail travel, when the publicity departments of our great rail companies were developing their iconic posters, times would be different. You would be looking at and listening to the clattering of the old mechanical destination boards and the station tannoy would be announcing your train’s departure. “Platform 11 for the Mid Cheshire Line train to Chester via Stockport, Altrincham, Knutsford and Northwich”. 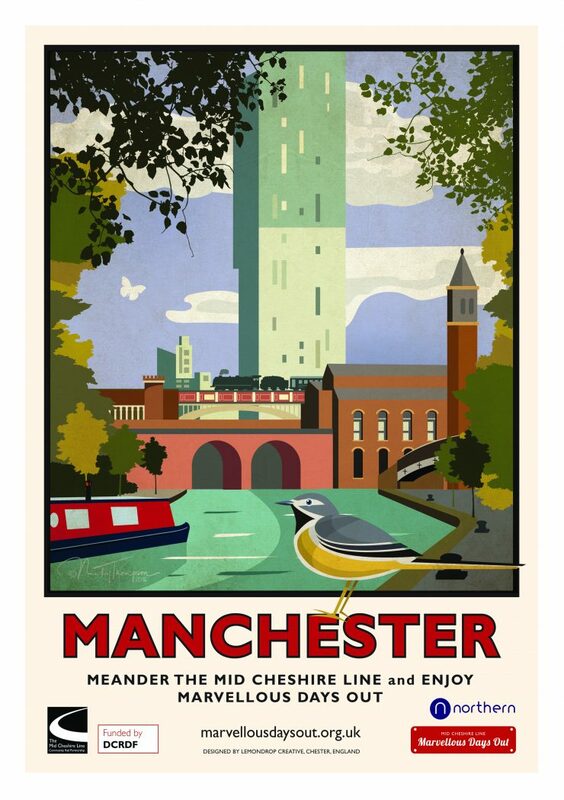 Yes, that is the route of the Mid Cheshire Line but today you may have chosen to spend the day in the bustling city of Manchester where there are so many things to see. It could be shopping, going to a museum or art gallery, sightseeing or visiting an exhibition or festival. If you are new to the city why not start with a day’s sightseeing? What better way to see what the city has in store. Last time we had friends over, we took to the tram. An off-peak tram travelcard cost us a fiver each and the ticket allowed us to travel from one end of Greater Manchester to the other. It was a trip around the city that showed us the sights including a roller coaster ride up to Media City past Salford Quays and the docks. You can even get out to Bury on the Metrolink for some black pudding and to Rochdale at the foothills of the South Pennines. One of the city’s hidden gems is the Museum of Transport, Greater Manchester at Cheetham Hill. Here you can explore the story of the city’s public transport from its beginning in 1824 to the Metrolink tram of today. There are over 70 old buses to see ranging from horse buses to motor buses to trolley buses. There is memorabilia to view, documents to research and thousands of photographs. Even iconic posters. Just like ours!